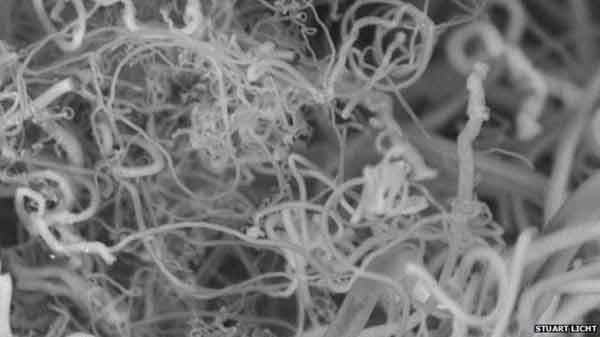 Washinton, US (BBN)-Scientists in the US have found a way to take carbon dioxide (CO2) from the air and make carbon nanofibres, a valuable manufacturing material. Their solar-powered system runs just a few volts of electricity through a vat full of a hot, molten salt; CO2 is absorbed and the nanofibres gradually assemble at one of the electrodes, reports BBC. Nonetheless, it could offer a cheaper way of making carbon nanofibres than existing methods. “Until now, carbon nanofibres have been too expensive for many applications,” said Prof Stuart Licht of George Washington University. He was speaking at the autumn meeting of the American Chemical Society in Boston. Carbon nanofibres are already used in high-end applications such as electronic components and batteries, and if costs came down they could be used more extensively – improving the strong, lightweight carbon composites used in aircraft and car components, for example. Dr Paul Fennell, a chemical engineer and clean energy researcher at Imperial College London, said: “If they can make carbon nanofibres, that is a laudable aim and they’re a worthwhile product to have. Prof Licht insists it is worth trying. Meanwhile, other chemists were impressed by the simple fact that Prof Licht’s team had produced nanofibres from atmospheric carbon. “These cells are relatively inexpensive in terms of energy consumption – it’s definitely a realistic approach to producing the nanofibres,” he said.